Blogger buddy, Roger in New Zealand (All Things Rogey) came up with a super idea of each person choosing their favorite five pictures of the year. There were only a few 'rules' and I managed to break them all, including the deadline. Here are my Fav Five. *Actually since I'm late getting this done, I'm going to bend the rules slightly and call mine the "Elite Eight". Bending the rules just a wee bit further, number 7 was taken (on my camera) by a tour guide. My annual Fathers, Sons, & Grandsons ride. One of my favorite rides every year! On our way the a Vulcan Rally held this year in Torrey, Utah. This is the Mormon Temple in Manti Utah. The Goldon Ratio monument in Green River, Utah. Good times with good friends. This seven day ride took us over the Chief Joseph hwy in Wyoming, Bear Tooth Pass in Montana, and upper and lower Yellowstone NP. And yes, this picture was taken on my camera, but by the tour guide that took us through this building. Yes I rode it, and a couple more like it until the snow was too deep to continue. Southern Utah. In the winter you have to take what you can get! Todays weather report says it will be around 35 degrees at noon....time to stir the oil and fluff up the battery. I announce my intentions on a MC forum a few days before the ride - what time I'll leave from where, that type of thing. There was some interest... here is a picture of all the bikes at the start of the ride. And yes, it WAS a gloomy day. All the bikes lined up in front of the Saltair concert venue. My ride will take me past the Great Salt Lake to the small town of Stockton. I'd planned on eating at the Stockton Miners Cafe, but when I arrived I saw they were closed (Sunday), no problem I just went down the road five more miles to Penny's Cafe. Penny's is located on lonely hwy 36 about halfway between the towns of Stockton (pop 616), and Rush Valley (pop 453). Ten miles separate those two towns and Penny's is right in the middle. The little cafe is able to survive by having a very personable staff and serving excellent food. Today I had the chicken fried steak (breakfast version) and it was delicious, hot, and HUGE. I ate more than I should have and still left a bunch on my plate. I couldn't get the bike any closer to the building due to the ice on the parking lot. The pennies at Penny's Cafe. There are 12,002 pennies on this counter. I wish I had looked at the name of the young gal that helped me, she is a sweetheart! Thanks Penny's for a great meal. After eating I get back on the bike for the ride home. The temperature had cooled quite a bit, so it was a straight shot home. Only about 100 miles, but.....in the winter you have to take what you can get! (The following was written by my favorite daughter, Kaybi). In the spirit of gift giving, Dad and I wanted to share a story. Neither Dad nor I can ever talk about this story and not laugh. A year and a half ago I was living in Fort Rucker, Alabama. My husband was going to school down there and my kiddos and I tagged along for the ride. For that very reason I was a regular on Amazon.com to send Birthday gifts to the fam back home. Dad’s birthday was coming up and I was on the hunt for the perfect gift. Because shipping on a 2009 Yamaha FJR1300 in black cherry was a smidge out of my price range I decided to find something else. Besides, Dad was pretty happy with his strom. I was at my friends house and saw the funniest looking whisk I’d ever seen. Instead of the metal strands wrapping around and back into the handle they were straight with little balls on the ends. I asked her what it was for. She said it was the absolute best for making gravy. SOLD! So, when I spotted the whisk at my friend’s house that was supposed to make gravy even better, I knew it was the perfect gift for my Dad. I looked and looked online. I checked all my favorite kitchen supply stores. Nothing. I couldn't find the stupid thing anywhere! 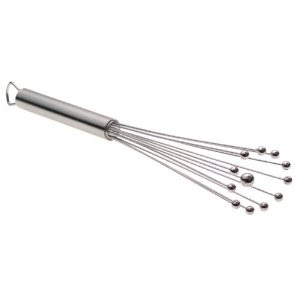 Plus, what was I supposed to Google, ball whisk? Go ahead and give that a try and tell me what pops up. I finally found it on Amazon. Sweet! I ordered that bad boy and had it sent right away. I made sure to send it as a gift so Dad would get a little birthday message with his package. I was sure Amazon would print my message on a card and throw it in the box. That's what they do with flowers, so I figured it'd be the same thing. I waited and waited for that package to get to Dad. I checked the package tracking number every day and sometimes twice a day. I was so excited for Dad to get this gift. I just knew that he'd rip it open and run straight to the kitchen to make some toast and gravy. After he finished his meal I knew he'd call and tell me what a life changing experience it had been and that it was the best gift he'd ever received. The day finally came! I tracked the package, got confirmation that it had been signed for and waited because I just knew my Dad was about to call. Ok, ok, he just hasn't finished his toast and gravy yet. Alright, he's had plenty of time to cook and finish his meal, where was my phone call?!! Maybe he was busy and hadn't had time to use the whisk yet so I decided to call him and see what he thought. I was SO excited! I called and anxiously waited for him to answer. Dad answered, "Hello?" "Hi Daddy!" I said. "Hi" Dad said flatly. "Did you get my gift?" I asked. "Yes" he replied again flatly. I was beginning to sense some irritation in his tone. What the heck? It took me days to find this gift. The gift of all gifts. The one that I knew he was sure to love. Well, apparently he had ordered himself a birthday gift from Amazon right about the same time I did. He too had been watching and waiting. When the delivery truck pulled up to deliver the package Dad was equally as excited for what he had ordered. It was a Cobra FI2000 which is a digital fuel processor that he spent approximately $150 on. You can imagine his shock and subsequent irritation when he ripped open the much anticipated package expecting to find his new digital fuel processor and instead found a funny looking whisk. What on earth had Amazon sent him? Not only had they sent him the wrong item, they had charged him about $150 for the dumb thing! He checked that the package was indeed his package. He looked for a packing slip. There wasn’t one. Remember I selected gift so of course they wouldn't send one. Dad was ticked! He went to his office and started looking for a phone number for Amazon. Someone was going to hear about this and it was going to be fixed today! Again, no packing slip to snag a number from. He looked the box over trying to find a number. He started getting even madder because not only had they sent the wrong item and charged him for it but they made it impossible for him to report it. Was this someone's idea of a joke? Because it wasn't funny! About that time my Mom came home. Dad showed her what came and she was equally irritated. Dad told Mom exactly what he was going to say once he got a hold of someone. It wasn’t going to be pretty. Mom started helping Dad look for a number. She grabbed her glasses and picked up the box. After a few minutes she started to laugh. Mom handed some glasses to Dad and showed him the bottom corner of the shipping label. Dad chuckled. In the bottom corner of the shipping label in tiny font it said, "Happy Birthday Dad. I love you!" Hey Ladies and Gents, I'm Tombstones daughter, Kaybi. I had the opportunity to go to the Festival of Trees today with my rug rats, my Mother and Sister in law and her kids. After my kids cried through another year of pictures with Santa and Mrs. Clause we started walking up and down the many many rows of Christmas trees. We found Dad's tree and I couldn't find my phone fast enough when I saw the sold sign. I had to tell my Dad the good news right then! The Festival of Trees is such an amazing fundraiser. More than $29.3 million has been raised since 1973. Of that, $1.9 million was raised in 2010 with 95,000 people attending the week long festival. All of the funds raised go to the Primary Children's Hospital. I'm so proud of my Dad for participating in such a wonderful fundraiser. I'm proud of him for his creative idea and seeing it through till it was finished. I'm proud of my Mom for supporting him through all of this work. A big thank you to all those who helped him along his way and donated items for the tree. One last thing, the company who bought the tree was Struck Axiom. Dad and I were curious so we looked them up and it all made sense. They are a creative company that thinks outside the box. An especially big thank you to them!